Summer time in Hong Kong happens to be the visiting season of typhoons coming from the Pacific Ocean. Quite oddly, typhoon announcements are welcomed with anticipation of a day off from work or class, and disappointment once it’s not strong enough to warrant shutdown or downgraded just before business hours. Hong Kong takes typhoon announcements quite seriously, as special arrangements are made not only for offices and schools, but also concert performances, court meetings, outpatient hospital appointments and many others. That’s because typhoons not only bring stronger gale winds, but can also bring heavy rains that cause flooding and landslides, and that’s the real meaning of danger for typhoons in the city. 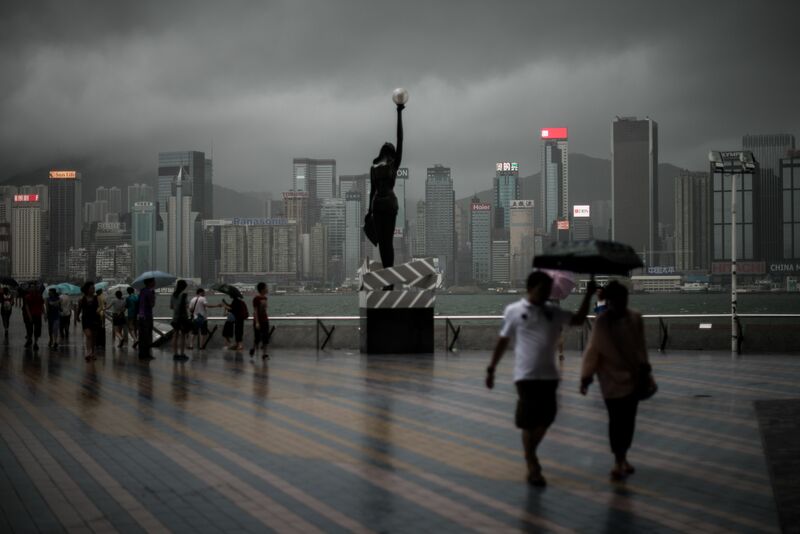 At this time, the Hong Kong Observatory becomes the favorite website or app to visit, as most Hong Kong people on a weekday see a possibility of being sent home for safety. With limited options, what should you do, and should not do during this temporary pause in a vibrant Hong Kong’s activities. The default thing to do once a typhoon announcement is made is to head home. Although T3 signal will only affect kindergarten students — no classes — an upgrade to T8 brings that possibility of people being sent home prior to the upgrade. At this time, when a surge of city’s workers and students head home, public transport will be packed even when upgraded to peak-hour frequencies. If you’re told to go home, doing so is the best option; some means of transport — light trains operating above the ground, trams and ferries — could be suspended once safety becomes compromised. When you’re taking a taxi, don’t buy the idea of drivers charging extra as they claim their insurance policy don’t cover driving during typhoons. There are plenty of things to do at home during typhoon. You can finish your work, catch up on lost sleep or movie binge on Netflix. There’s no place like home. 2. Make your home safe. For your safety at home, especially if stronger typhoons are expected, tape your glass windows with adhesives to form large X’s. This helps prevent broken shards from flying all over the place just in case an upper floor neighbor’s flower pot, umbrella or other heavy object hits. Remove items that might be blown away such as laundry, flower pots amd other loose items, and place them indoors. Otherwise, tie them onto a strong structure. If you live close to a cinema, but have been unable to catch a movie due to tight schedule, this is the time to fulfill it. Cinemas usually don’t close during typhoons so they’re a typical go-to place for folks who don’t think home is the best place to be during typhoons. 4. Take advantage of queue-less lines. If there’s a thing that’s good about typhoons besides taking a break of your week-long routine, it’s the opportunity to take advantage of something that’s not usually happening during a busy weekday. While lines on groceries and supermarkets might be longer than usual, you might get a haircut without having to wait for half an hour or visit a fitness gym with plenty of vacant facility, for example. But if you’re not sure, make a call to ensure you’re not coming to an empty line simply because it is closed. Surf is high during typhoon season, so adventure seekers may find them exciting. But needless to say, it’s a dangerous place to be during typhoon upgrades of T8 and above. Lifeguards have long vacated the area, and police may get into confrontation with people who have no regard for safety. In some cases, when accidents happen, authorities will deploy and risk lives of staff to get someone back to safety just because he or she did not heed a simple call to stay away from the hazards of the sea during typhoon. Water is a dangerous medium to travel during typhoon season. If an occasional ferry ride gets rocked by waves created by larger vessels passing through Victoria Harbour, the risk is higher when you travel in the midst of a typhoon warning. That’s why expats living in Lamma, Cheung Chau and other outlying islands have to be mindful of typhoon warnings and make necessary arrangements to go home as soon as they can, since ferry services are suspended once certain typhoon signals are hoisted. In case Pokemon Go is still popular by the time you read this, those PokéStops and Pokémon gyms can wait for your next visit on a fine day. On a windy day, let alone when a typhoon is issued, hazards outdoors can happen. The game, which requires players to look at their mobile devices for interesting Pokemon stops while in motion, can divert someone’s attention from the street pavements or open fields, where imminent danger can happen. Falling debris from homes upstairs may hit you or hanging neon signs can collapse and you don’t want to be underneath it. 4. Going somewhere without calling first. You may be interested in visiting the museum or an indoor facility just because someone told you so. But it pays to be assured it’s open for business and someone to accommodate you when you arrive. As mentioned, there are special arrangements in place for government offices, shops and tourist attractions during this type of weather situation.